Speaking today in Ramlila Grounds, the “maidan” of the people’s movement which birthed the Aam Admi Party, just over a year ago, Kejriwal, in his acceptance speech as Chief Minister of Delhi state government, confided that it was God who had ordained the Tsunami like landslide win of the AAP (96% of the available seats). None of the 100,000 supporters gathered there doubted for a minute that this was indeed so. For them Kejriwal is indeed a God sent savior from the ugly corruption of state agencies; the morbid face of the traditional parties in Delhi and the lop sided “development” which leaves 60% of Delhi’s citizens living in muck and filth without water or sewage systems, though electricity supply has improved significantly, post privatization by the previous Congress government of Shiela Dikshit (http://www.cuts-international.org/ review of customer satisfaction 2015). 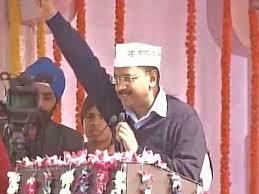 Kejriwal still concludes his speeches with a rousing “Inquilab zindabad” (long live the revolution) preceded by Bharat Mata Ki Jai (Praise be to Mother India) and followed by Vande Matram (the title of India’s National Song) but it is clear political experience has mellowed him. Today’s signs of maturity included a firm rejection of the recently voiced ambitions of several AAP members to ignite AAP “fires” all over the country and spread the party – a mistake they committed last year; a commitment that Kejriwal will personally serve the people of Delhi for the full five years – he unsuccessfully contested the Varanasi polls against PM Modi; a reality check on the speed at which citizens should expect change; reaching out to non-supporters with the assurance that he would be everyone’s CM not just the AAPs and emphasizing agendas which are within his constitutional mandate. But most of all what impresses is the choice of candidate which carefully reflects caste, regional and religious representation with poorly performing Ministers, fashionistas and charlatans from his previous government, excluded. AAP is clearly a new age substitute for the erstwhile Congress minus its dynasty, corruption, clunkiness and with a dash of the Communist zeal for equity. Today, for the first time in four decades, the Gandhi cap- a boat shaped headgear of white coarse cotton, was once again the headgear of choice in Ramlila Grounds. A sea of 100,000 white Gandhi caps, emblazoned with the iconic jhadoo (broom) symbol of the AAP bobbed and milled about, as this simple instrument of defiance and political empowerment, dating back to India’s independence struggle, was proudly donned by all present. How long can the romance and dedication of a few drive a government to deliver? This is what remains in doubt. The cabinet line-up is unremarkable and four of the six Ministers, faceless new-comers to both politics and administration. Kejriwal pledged that he and his team would work 24X7 for the people without rest. But this is meaningless hyperbole. Every worker knows that efficient governments are run not by tireless people but by systems and institutions, both of which remain in short supply. Kejriwal mentioned that the government would seek the advice of Bhen (Sister) Kiran Bedi (the BJPs nominated candidate for CM who was humiliatingly defeated by the AAP) and Ajay Makken of the Congress. One hopes he will also seek more professional help to flesh out his 70 point manifesto. Service delivery is of course priority number one. Water, sewage and transport are directly within the Delhi government’s ambit and should be his focus if he wants to show performance. In electricity the private utilities have consistently improved their performance. Embedding consumer friendly practices in regulation and a consumer representative in the Delhi Electricity Regulatory Commission can deal effectively with the lack of trust between the utility; the regulator and the government. The more generic reforms can follow. Policing, housing and land management is not in the mandate of the Delhi government so these cannot be his government’s priorities. At best he can and should be a spokesperson for the citizens and press the Union government to perform on these issues. Setting specific targets for water supply, sewage disposal and treatment and travel time in Delhi should be right up the street of the IIT alumni who crowd the AAP. Time to descend from the realm of high rhetoric and morality into the mucky business of unclogging the pipes of Delhi’s governance. Show us that you can deliver clean water at a reasonable price to all; that every dwelling and mohalla in Delhi gets a sewage collection system; that Delhi’s sewage is treated before it is discharged into the Jumna river and that public transport is available within a ten minute walk of every dwelling in Delhi at a frequency of not more than 15 minutes during peak hours, 30 minutes during off-peak hours and 60 minutes all through the night. If you can do this, sir, in 2020 you are sure to get 99% of the seats, possibly with the BJP choosing not to contest.